Toms River Door & Window proudly installs Marvin replacement windows in homes throughout the Jersey Shore because they meet our exceptionally high standards for quality. A leading name in the industry, Marvin replacement windows are the ultimate solution for all of your window woes. 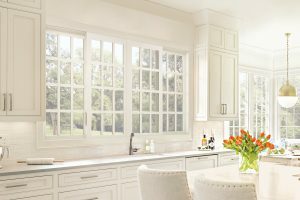 Fitted with gorgeous wood frames inside and out, Marvin replacement windows will elevate the aesthetic of any style home. They are also the ideal fit for historic homes as the wooden frames allow buildings to maintain their original integrity. With a plethora of styles, wood types, grid patterns, frame colors, and stains to choose from, the design options are virtually limitless. Our design experts will be happy to help you customize your windows, ensuring that they will complement your home beautifully. A member of the Marvin family, Integrity replacement windows are among the most durable windows on the market. Built with Ultrex® pultruded fiberglass, these replacement windows will endure the harshest weather conditions without showing signs of wear. Available in many different styles and design options, these windows will look beautiful for years without chalking, peeling, cracking, or fading. As a Marvin Authorized Replacement Contractor (MARC), Toms River Door & Window is uniquely qualified to offer and install Marvin and Integrity replacement windows. Our technicians are factory-trained and -certified by Marvin, so you can feel confident that we have the skill needed to install your new windows with masterful precision. Plus, with more than 48 years of experience, we are a proven window installation expert. Make your home a more beautiful, comfortable, and secure place to live by having Toms River Door & Window install Marvin or Integrity replacement windows. To learn more, contact us today. We’ll be happy to schedule a free, no-pressure consultation at your home in the Jersey Shore.